Apple with the announcement of the new Apple iOS4, and Apple iPhone 4 has launched a new advertising system called iAds which helps the application developers to earn money with their free or low-cost apps. The mobile advertising network is going to start from July 1st, in both iPhone and iPod Touch which run on iOS4 operating system. iAds combine the emotion of TV advertising with the interactivity of Internet advertising, giving advertisers a dynamic and powerful new way to bring motion and emotion to mobile users. The brands that are already into this advertising and would advertise for the developers are – AT&T, Best Buy, Campbell Soup Company, Chanel, Citi, DirecTV, GEICO, GE, JCPenney, Liberty Mutual Group, Nissan, Sears, State Farm, Target, Turner Broadcasting System, Unilever and The Walt Disney Studios. Already $60 million of advertising budget has been set in the year 2010, and that is around 50% of total mobile advertising revenue in the whole U.S. One of the advantages would be that the application users won’t need to leave the app, but would be able to watch the ad there itself. Apple will handle the serving of ads, and the advertising can use various formats of ads. Everything still is much into expectations, as the release is on July 1st, and only then one would know more about the advertising and publishing of the ads within the applications. 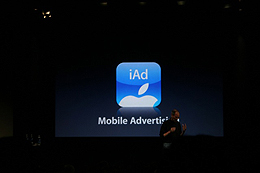 iAd, which is built into iOS 4, allows users to stay within their app while engaging with the ad, even while watching a video, playing a game or using in-ad purchase to download an app or buy iTunes® content.